Type; There are 3 basic types of mops: steam, wet, and dry. A lot of mops can do double duty as wet or dry. Steam mops usually only have one function: they’re great for disinfecting and deep cleaning. Power: We included quite a few manual mops on our list because sometimes there’s nothing better than old fashioned elbow grease. But, we found some great corded and battery-powered options, too. There really is quite a variety when it comes to mops! Multi-surface Use: This is a guide for tile mops so you know our picks are all great for tile. But you probably have more than just tile floors in your home. Most of these mops work well on your other surfaces, too. Pieces: This number includes the mop and any cleaning accessories that come with it. They really make it easy for you to start taking care of business right away. You’ll find everything from cleaners to buckets to multiple kinds of cleaning pads. 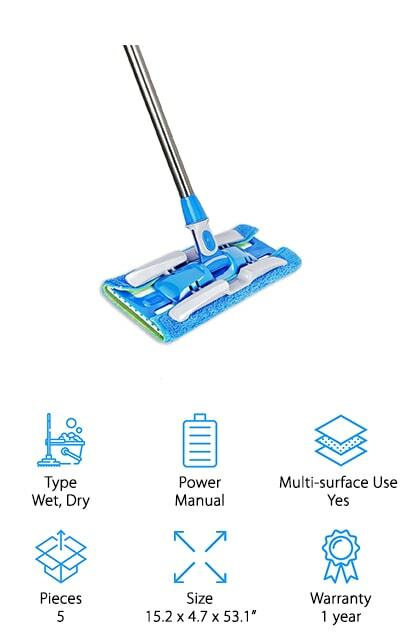 Size: Having a mop with a large cleaning head is great. It covers more area and gets the floor clean a little bit faster. A lot of these have handles that expand and are a good fit for users of any height. Warranty: These warranties vary pretty widely, we were actually a little surprised. Some of them don’t have any warranty at all. One of these does come with a lifetime warranty but the average length is 1 year. Now that you know what to look for when trying to find the perfect mop for your tile floor, let’s get into our product reviews. We put our top and budget picks right at the top of the list so they’re easy to find. This is the best place to start if you’re in a hurry but stick around if you have the time. All of these products are pretty awesome and they’re all so different! Okay, let’s get started. 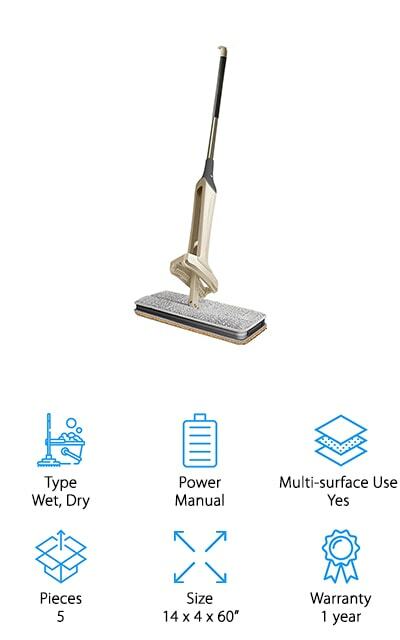 Our top pick and one of the best rated mops for tile floors is the BISSELL PowerFresh Steam Mop. One of the things that people love the most about it is that it kills 99.9% of germs and bacteria using nothing but the power of steam. It really helps you get rid of stuck on messes, too, thanks to the flip-down scrubber. You can choose from 3 different steam settings, low, medium, or high. Plus. when you want to add some extra freshness, just use the included Febreze fragrance disc. The power cord is 23 feet long so you don’t have to keep unplugging to move to different outlets. And, get this, it’s so powerful that it heats up to steam clean ready in only 30 seconds. If you’re looking for the best wet mop for tile, check out our budget pick. 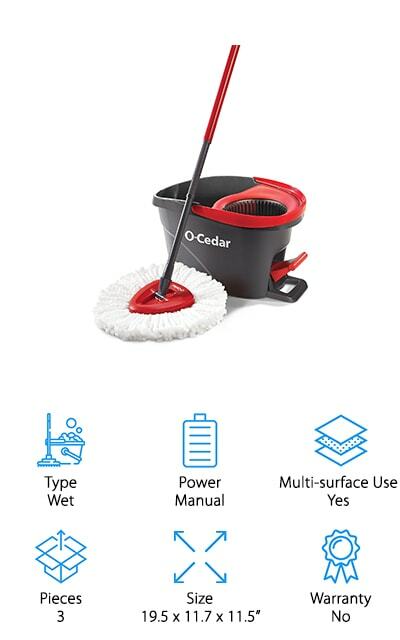 The O-Cedar Spin Mop comes with a microfiber mop head that removes surface dirt and deep cleans your tile. The triangle shaped mop head rotates 360 degrees. You can easily clean around and under furniture, in tight corners, and even in those tough to reach places, like around and behind the toilet. The bucket shares the spotlight because it’s just as important when it comes to cleaning power. It has a built in ringer with a foot pedal. Not only do you not have to hand wring it. You don’t have to touch it at all which is particularly nice when you think about that toilet we were talking about cleaning around earlier. 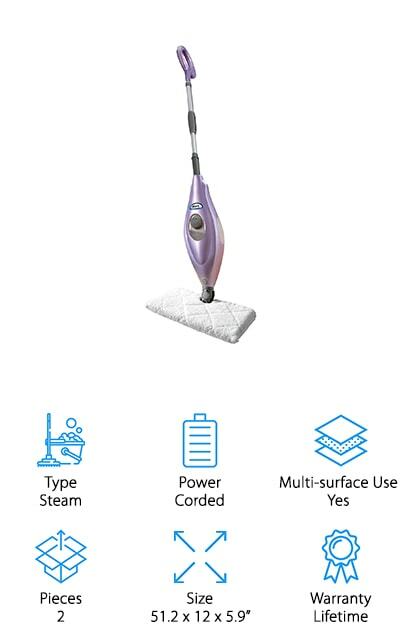 Another option for best steam mop for tile is the Shark Steam Pocket Mop. It’s steam ready in only 30 seconds and kills 99.9% of germs and bacteria on your tile floors. The best part is it does it using only water and no harsh chemicals. 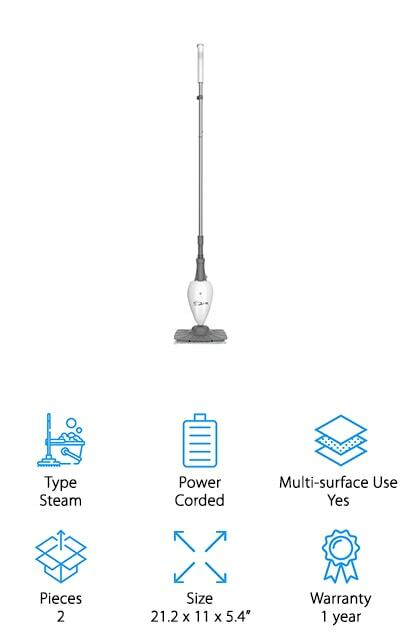 This mop has a long reach thanks to the 25 foot long power cord. You can do a whole room without having to unplug and move to a new outlet. Actually, you might even be able to do 2 rooms without moving to a new outlet, depending on the size of your home. 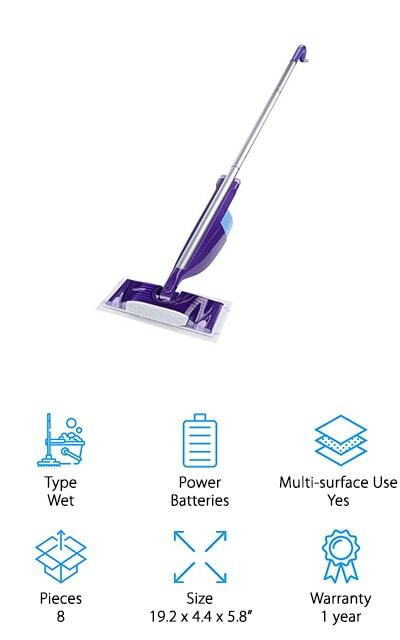 That’s not the only thing about this Shark mop that saves you time. The XL water capacity means you’ll have an XL supply of steam and no stopping mid-clean to refill the reservoir. Another choice for best wet mop for tile floors, if you’re looking for a manual mop, is the Mopnado Spin Mop. It has a stainless steel handle that’s lightweight but also really durable. This mop has a microfiber head that swivels 180 degrees. That means you can easily reach under furniture. And get this: the handle is extendable up to 56 inches! That means you can also use it to clean windows and even ceiling fans if you want to. 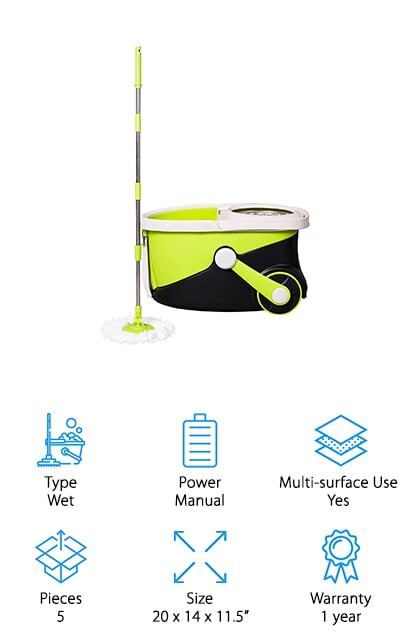 That’s not all, this mop actually comes as part of a cleaning system that includes a large bucket with large wheels and 2 handles for easy mobility. And because there’s a spin dry basket, you never have to touch the mophead unless you’re getting ready to throw it in the washing machine. When it comes to wet mops for tile floors, one of the most popular brand names has to be Swiffer. They have a few varieties to choose from but we’re partial to this one, the WetJet Spray Mop. This starter kit includes the mop itself, 5 cleaning pads, a bottle of cleaning solution, and 4 batteries. You can get started on your floors as soon as you open the box! The cleaning pads have a special absorb and lock strip that traps dirt and grime so you’re not just pushing the mess around. 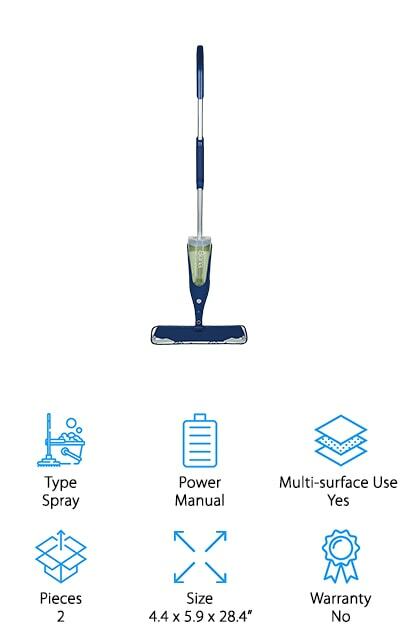 There are also 2 small nozzles on the front of the mop that spray out the cleaning solution when you need it for tough, stuck on dirt. And here’s the kicker. Swiffer offers a money back, satisfaction guarantee on the starter kit. Here’s another awesome mop that’s in the running for best steam mop for tile floors. 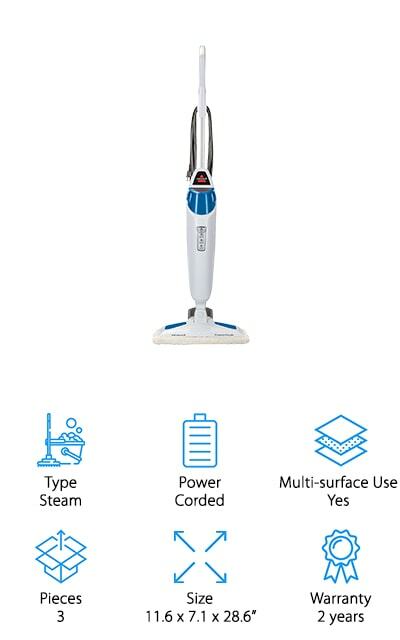 The Light ‘n’ Easy Steam Mop penetrates deep and sanitizes your floors, killing 99.9% of bacteria and germs using only steam power. 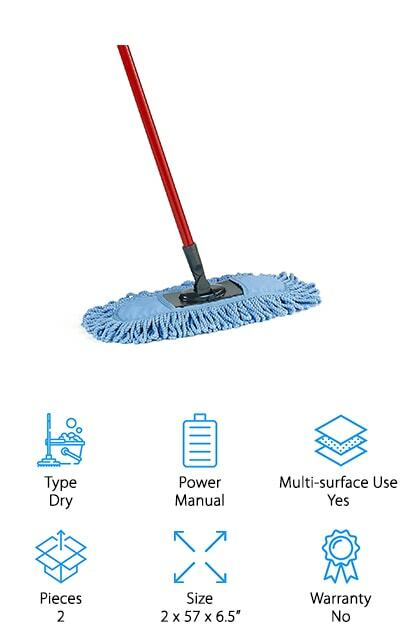 We really like the design of this mop because it’s ergonomic and has a soft handle that makes it really easy to maneuver without any strain to your neck, shoulders, or back. It’s really lightweight, too, as just under 4 pounds. Although it has to be purchased separately, we liked that it has a carpet refresher accessory. You really can use this on just about any floor surface in your home. Light ‘n’ Easy really stands behind this product, too. They offer a 1 year warranty as well as a free replacement policy. If you want something to help you clean up hair, dust, and dirt between deep cleanings, you can’t do much better than the best dust mop for tile floors. According to our research, that’s the O-Cedar Dust Mop. For starters, it has a flexible head that’s made of microfiber and chenille that’s really good at trapping dust and dirt. One thing that we really love about this simple design is it makes it so easy to clean along the tops and bottoms of your baseboards while you’re doing the rest of the floor. And that’s not all, it’s also the perfect size and shape to get into tight corners and even under furniture quickly and easily. The mop head is extremely eco-friendly and can be washed and reused up to 50 times. The YONILL Double Sided Mop is the best mop for tile floors that can do double duty as both a wet and dry mop. How does it do it? With double sided microfiber pads. The grey pads are super absorbent and great for picking up dry dust and dirt. If you have dry, stuck on dirt, you’ll love the nylon wire fibers on the orange mop heads that quickly cut through tough messes. The mop head rotates 360 degrees and is really flat so it’s pretty easy to maneuver it around and under tight space. And get this, at 14 inches wide, it covers a large surface area that cuts down on cleaning time. You don’t have to worry about touching the mop pads when they’re dirty and gross, either, just use the self-wringer. Next up is the Happinex Flat Mop complete cleaning kit. It includes the mop itself with a stainless-steel handle, 2 reversible mop clothes, and 2 standard mop pads. All of the pads are machine washable and can be reused again and again which is great for the environment and your budget. You can use this as a dust mop for quick cleaning when you need to pick up dust, pet hair, and dirt from your floor. When it’s time to clean tougher messes, you can use this mop with your favorite tile or hardwood floor cleaner, too. Just spray and wet mop as you go without having to drag a bucket around with you. The mop head rotates 360 degrees so it’s easy to get under and around furniture and into tight corners. Last up is the Bona Spray Mop. Bona is a pretty well-known and trusted brand with it comes to floor cleaning. The mop base on this spray mop is pretty impressive. It’s 15 inches wide which covers a lot of surface area and will help cut down on cleaning time. Plus, the corners are flexible to help prevent damage to your furniture or baseboards in case you bump into them while you clean. This mop comes with a full size bottle of Bona’s laminate, stone, and tile cleaner. Just fill up the cartridge, put on the microfiber mop pad, and you’re ready to start cleaning. The handle is long, sturdy, and easy to maneuver. When you need cleaner just pull the trigger to get a fresh mist of spray.